You know easy, something like making hamburgers. Trying to come-up the first time, with my best meatballs, was something more like playing a game rather than cooking. 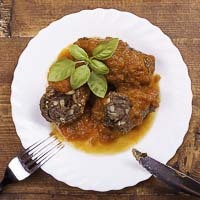 Polpette (pohl-PHE-teh) is the Italian word for meatballs, and they are well loved in South Italy. 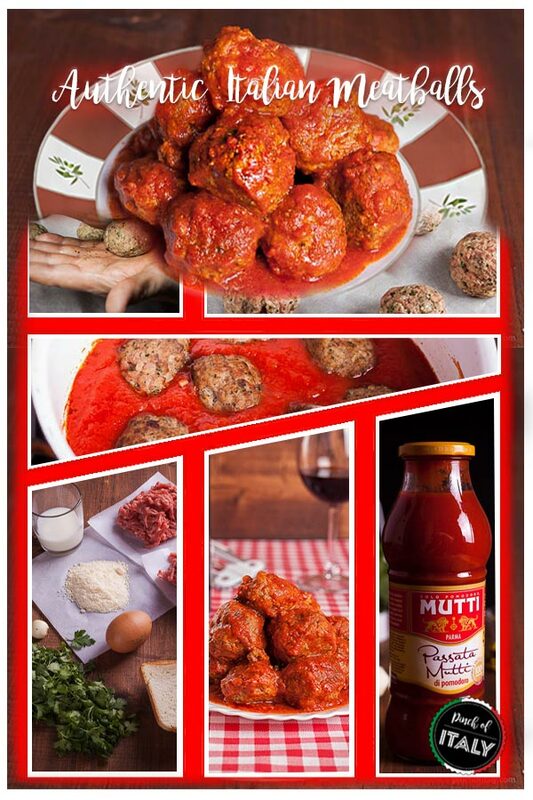 But if you're making them Italian-American style, maybe with spaghetti, then the size goes up big as a tennis ball. In a bowl combine the bread and milk together. 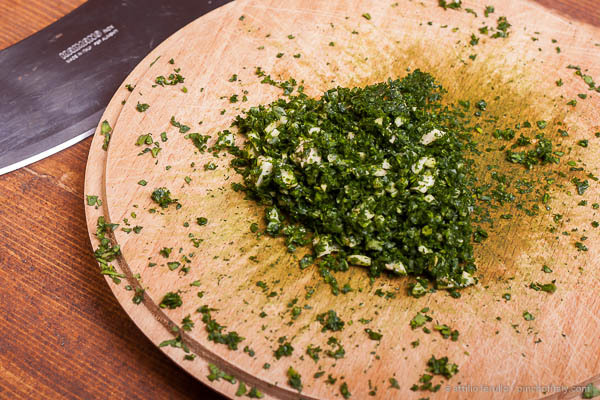 Add all the ingredients: beef, pork, egg, parmigiano, parsley, garlic, salt and pepper. Mix all with your hands, or with a fork, until you have a smooth compound. 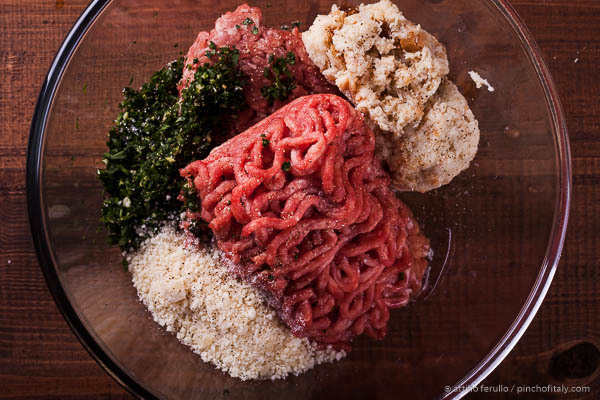 To form the meatballs roll within the palm if your hands about 3 tbsp (45 g) of meat mixture. Repeat this procedure until the end of the meat. In a frying pan over low heat, warm a small quantity of vegetable oil. 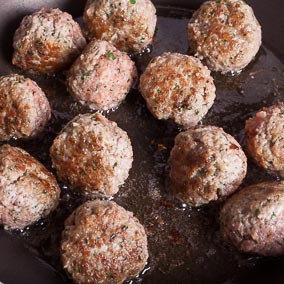 Add one by one the meatballs and when the edge sizzles turn them around for several times until nicely browned on all sides. The meatballs are ready to be added to the tomato sauce. 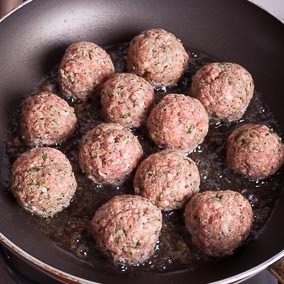 Fry or bake the meatballs until lightly brown so that most of the grease from the meat will melt in the pan and be discarded if you like or otherwise plunge them directly in the tomato sauce. Pour the olive oil in a saucepan with the chopped onion. On low heat start frying until lightly brown. Add all the bottle of tomato puree. 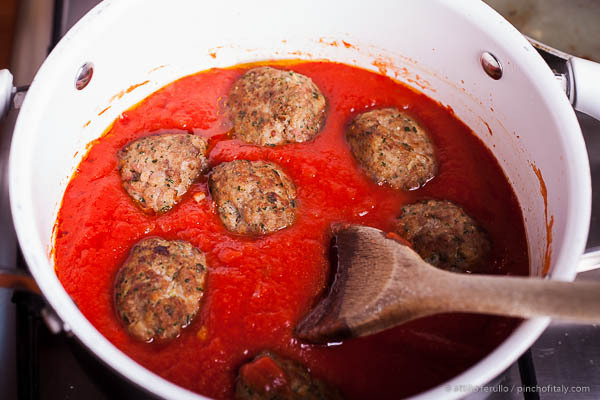 Remove the meatballs from the frying pan and plunge them into the tomato sauce. Cook for about 1 hour with a lid. Add a pinch of salt and stir occasionally. Add some water if the sauce dries too much. Once cooked through and ready, add a few basil leaves if you like. 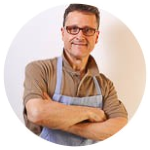 You may be a better cook than I am, and get your best Italian meatballs right away, and win, win, win. 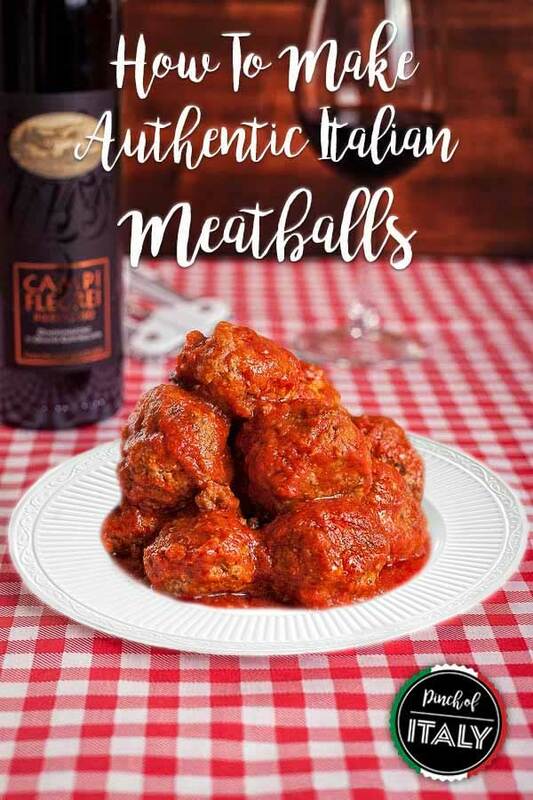 What ever your cooking skills are, if I finally made my best meatballs surely you can too! So lesson learned, I'm passing you my authentic, winning Italian meatballs recipe, from my trials and errors game. Begin by breaking the bread in small bits inside a bowl and then soak it with the milk. 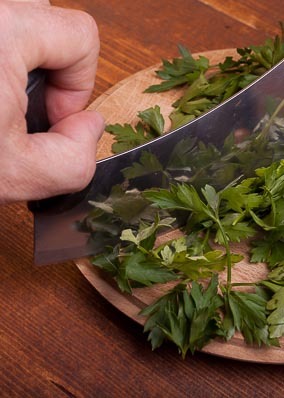 Remove the leaves of parsley from the stems and put them on a cutting board to be finely minced together with the garlic clove. I prefer my “mezzaluna” (half-moon) knife to do this task, because swinging up and down makes whole easy and safe. 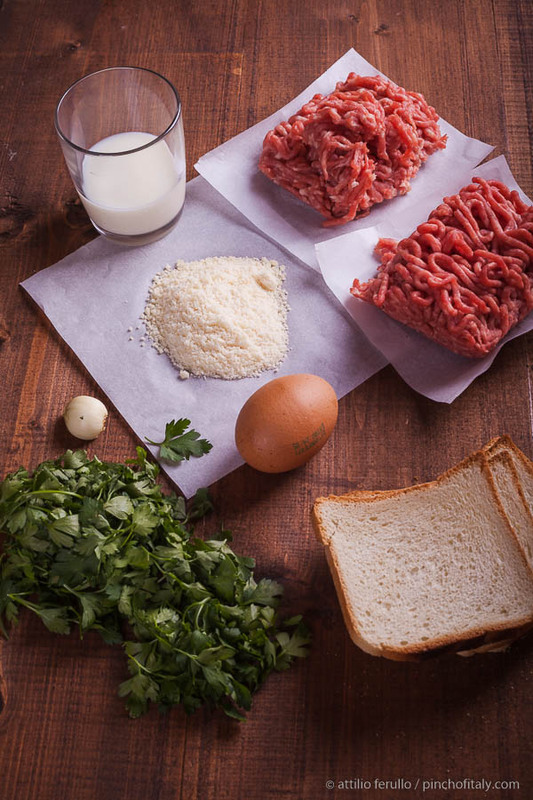 In a bowl add all the ingredients, minced meats, parsley and garlic, egg, cheese, soaked bread, salt and pepper. I belong to those, who likes to work with their bare hands in the kitchen. 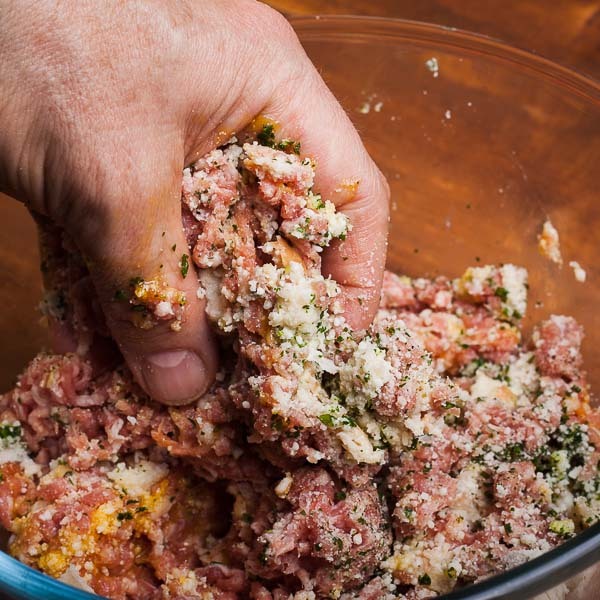 And if there's one recipe in which you have to throw your hands in that's Italian meatballs. Of course, you can still opt to mash all with a fork if you like. But even though, soon or late you still have to make the round shape with your hands or at least you have a mould. You need to end up with something very similar to a smooth and compact compound just like one giant meatball. Taking about 3 tbsp (45 g) of meat from the mixture, I start rolling within the palms of my hands until I get a good round shape. I like to make medium meatballs so not too big, not too small. I make about 12/13 meatballs ready to be lightly fried in a pan. 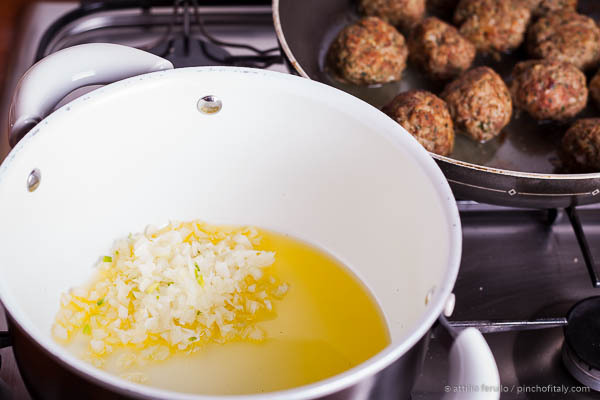 Pour in a frying pan about 1 tbsp (15ml) of oil and arrange all the meatballs around. Fry them until lightly brown, then turn off the heat and keep all aside. My family's most prefered bottled tomato puree for pasta is generally Mutti. 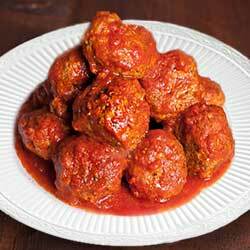 This succulent precooked tomato sauce goes well for these meatballs too. Pour the olive oil in a saucepan with the chopped onion. Turn on a low heat and start frying the onion until lightly brown. 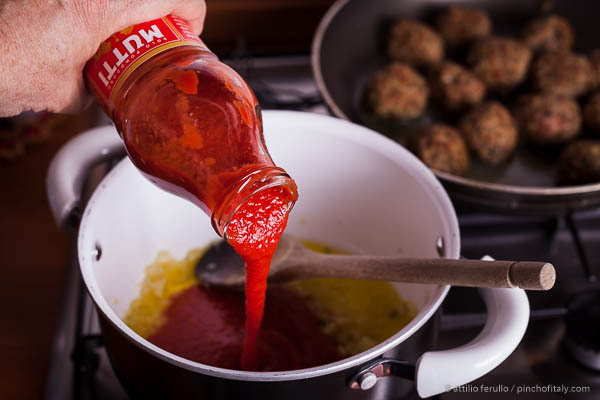 In a saucepan add all the bottle of tomato puree.Remove the meatballs from the frying pan and plunge them into the tomato sauce. Now and then, give a stir to the tomato sauce, and cook well through for about 1 hour covered with the lid. Add a pinch of salt. 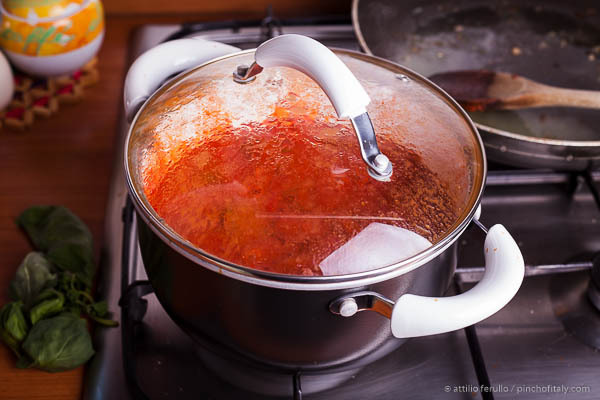 If the tomato sauce dries out, you can add about an ½ cup (118ml) of water. At last if you have a few basil leaves add them in the sauce. Now you could even think of making spaghetti and meatballs if you like. But remember though, there's no such spaghetti with big meatballs in Italy. That's more of an Italian-American recipe becamed famous abraod.